In this post, we ranked 5 of the best-selling mobile basketball hoops. These maneuverable basketball systems allow people to play or shoot basketball in places with limited space, such as a driveway or backyard (Source). Most portable basketball hoops have a hollow base users fill with water, sand, or other material to weigh it down and keep it in place (Source). Most portable basketball hoops also sit on wheels, making them easy to move around. Portable basketball hoops are popular and found in most neighborhoods. They allow kids to improve their skills and have fun with friends. Experts recommend setting up the hoop in a place where there’s lots of flat space — preferably concrete or asphalt. Also, look for a hoop that adjusts to accommodate small and tall players (Source). In this article, we look at 5 popular portable basketball hoop setups for your home. 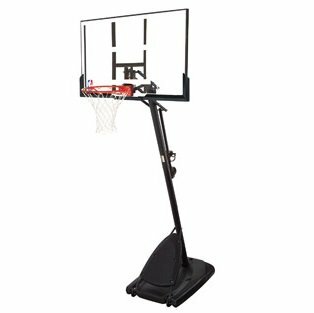 The Lifetime 90040 adjusts to accommodate a player’s height and features a 44-inch backboard made of polyethylene, which features a UV coating for durability. The height adjustability ranges from 7.5 to 10 feet. The base holds 27 gallons of either sand or water. Overall, users expressed satisfaction with this hoop setup, but some noted adjusting the height was more complicated than necessary. The Lifetime 52-inch portable hoop is similar to the previous but uses a stronger and larger backboard. At 52 inches, this polycarbonate backboard is stronger and shatter resistant. It features the same height adjustability of 7.5 to 10 feet in increments of 6 inches. Unlike the previous model, this uses a pneumatic lift system, making adjusting height easier. Slamming dunks feels better on this thanks to the compression springs. Lastly, this hoop comes with a 35-gallon base and a 5-year warranty. Up next is the Best Choice Junior basketball hoop. This hoop setup is budget priced and is good for the beginner or the family who doesn’t have a lot of money to spend. It’s constructed of heavy duty steel tubing and a polyethylene backboard, which holds up in most weather conditions. Although users liked how easy this basket is to move around, most noted they thought the backboard was too small. Spalding’s Pro Slam NBA hoop comes with all the bells and whistles one would expect from a well-known company. 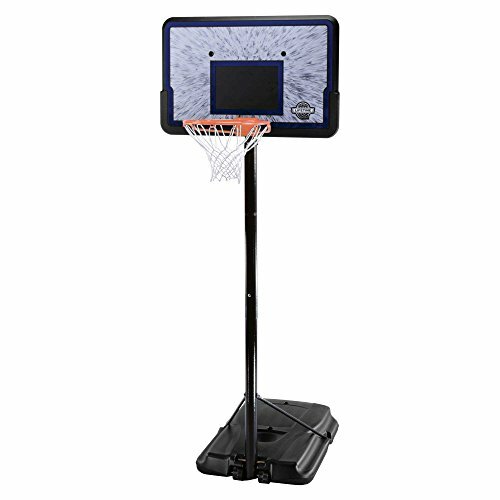 This portable hoop features a large plexiglass backboard that’s similar to what you’ll find on pro hoops. This hoop adjusts from 7.5 to 10 feet, and the angled pole gives users a bit more room under the basket than do straight poles. Lastly, the base holds 35 gallons of water or sand. Last up is the Lifetime 1221 Pro Court portable basketball hoop. This system features a 44-inch backboard that the company says is “virtually unbreakable.” The base holds 27 gallons of sand or water and height adjusts from 7.5 to 10 feet. This hoop comes with a 5-year warranty, and the price versus features make this a solid choice for those on a budget who don’t want to sacrifice quality. This basketball hoop system offered by Lifetime is handy, well-designed, and an excellent choice if you want to play basketball in your yard. Users love the price of the hoop, but some do note that it’s not as durable as they expected. 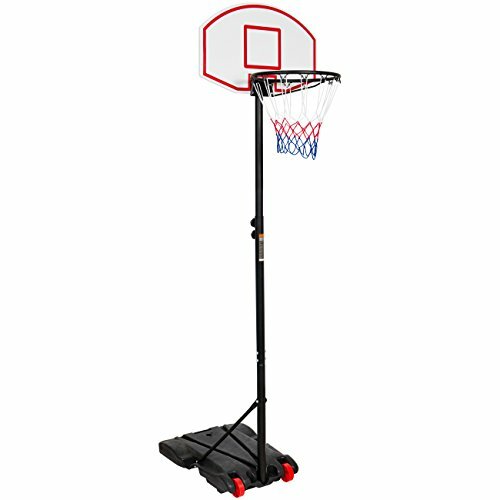 The Lifetime portable basketball system measures 44” x 44” x 162”, and it features a telescoping mechanism, which adjusts from 7.5 to 10 feet in 6-inch increments. Another great thing about this basketball system is that you can fill the 27-gallon base with water/sand and roll it wherever you want. Furthermore, the basketball hoop has 18-inch black solid steel rim, ½-inch braces, and it’s weather resistant. In addition to this, you get a 5-year warranty. As a whole, users have a favorable opinion of the Lifetime portable basketball hoop, and they praise its construction and stability. A buyer comments that he assembled the portable hoop fairly quickly and that he is pleased with its quality. He adds that you can move the net easily up and down the pole and that his kids love it. Another reviewer states that the 44” movable hoop is holding up quite well in wind and rain. But he warns that the instructions are complicated and difficult to understand. 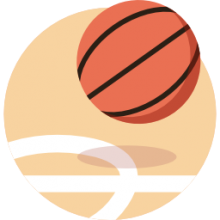 A user also mentions that the hoop is sturdier than he expected and that he recommends it as one of the best portable basketball hoops.However, some customers have noted that the package arrived with missing items and that it’s difficult to move around. If you want to buy a well-made portable hoop to surprise your children, you might take a look at this adjustable basketball system offered by Spalding. Users love the quality of the product, but some do note it’s not as easy to adjust it as they expected. The Spalding portable basketball hoop features a polycarbonate blackboard construction, an angled pole design, which is great because you have more play space under the basket, a 34-gallon base, and a steel pole. Moreover, the Pro Slim basketball system is adjustable from 7.5 feet to 10 feet, and it has a 1-year warranty. A purchaser mentions that the Spalding portable basketball pole is sturdier than he initially expected and that it’s holding well in bad weather. He highly recommends it as one of the best basketball hoops. A buyer also states that his kids use the hoop almost every day and that they don’t have any complaints. He adds that you can find some YouTube videos to help you with the assembly. Another reviewer mentions that the basketball system is heavy, but not hard to move and that the construction is durable. However, most customers warn that the basketball hoop is difficult to assemble because the instructions are insufficient and that some parts don’t fit as they should. This movable height-adjustable basketball system offered by Best Choice Products is all-weather proofed, well-made, and suitable for all ages. Users love the heavy-duty steel construction, but some do note that it’s smaller than they expected. The Best Choice Product adjustable basketball hoop measures 29” x 22” x 76.5”, and it features a polyethylene panel, an all-weather nylon net, and wheels so that you can move it around with ease. Another great thing about this basketball hoop is that you can use to practice on indoor and outdoor courts and you can adjust the height to suit the players’ height. What’s more, once you fill the base with sand/water the hoop will remain standing firmly. As a whole, buyers are pleased with the performance and the features of the height adjustable basketball hoop for kids, but they do have some complaints regarding the size. A reviewer mentions that the basketball hoop is great for his 5-year-old daughter and that it seems to be well-made and sturdy. However, he warns that the blackboard is too small for his liking and that his daughter will outgrow it in the next few years. Another customer adds that the Best Choice portable basketball hoop is an excellent choice for small places and that it rolls in and out easily. A user also mentions that he put the hoop together quickly and that it’s easy to adjust the height. If your children want to play basketball all the time, this portable basketball hoop system offered by Lifetime might be one of your best choices. Users love the quality, but some do note that the assembly instructions are poorly written and hard to follow. 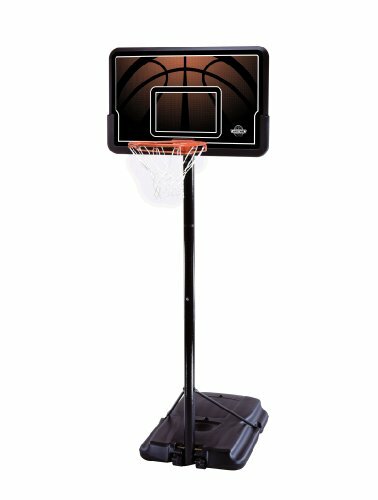 The Lifetime portable basketball hoop measures 34” x 52” x 10”, and it features a steel Slam-It rim with double-compression springs, a rust-resistant finish, a 35-gallon base, and a 52” shatterproof polycarbonate blackboard. Another great thing about this hoop is that you can adjust the height from 7.5 to 10 feet quickly, and it comes with 5-year warranty. A reviewer comments that the Lifetime 52” portable basketball hoop is a product of high quality and that it’s one of the best basketball hoops he has ever own. He adds that it took him a couple of hours to assemble the hoop and that the base is sturdy and stable. Another buyer shares that he has been using this adjustable basketball hoop system for more than two years and that it’s holding relatively well in all-weather conditions. The user also states that you can do the adjustment one-handed. A purchaser adds that the package arrived in excellent condition and all parts were accounted for. However, some customers have noted that it’s a nightmare to assemble the hoop and that you can’t do it on your own. Some also state that essential parts were missing when the box arrived. This portable basketball system offered by Lifetime is well-made, durable, and suitable for outdoor and indoor play. Users love the 5-year manufacturer warranty, but some do note that there were missing parts. 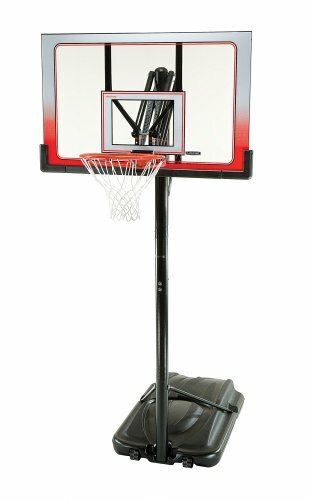 The Lifetime height adjustable basketball hoop measures 33” x 44” x 9.1”, and it features a 44” blackboard made of high-density polyethylene, a telescoping mechanism for adjusting the height from 7.5 to 10 feet, and a 27-gallon heavy-duty base. Another great thing about this hoop is the 18” classic steel rim with an all-weather nylon net in combination with the UV-protected polyethylene construction. What’s more, this movable basketball hoop is made in the USA. As a whole, buyers have a favorable opinion regarding Lifetime moveable basketball system, and they praise its durability and heavy-duty construction. A reviewer comments that the base is sturdy and that it has two caps for closure after you fill it up. He adds that it’s holding well so far and that it’s a real bargain. Another purchaser observes that adjustment might be tricky, but he is pleased with the size and functionality of the portable basketball system. A user also mentions that the hoop is perfect for his 6-year-old grandson and that it will do the job for the next few years. However, some customers have noted that the assembly instructions were not useful and that it was difficult to put the hoop together. Some also complain that essential parts were missing from the box. Before you buy the hoop there are some things that you should be aware of. Getting an outdoor court up and running, especially with one of these portable options, is a lot simpler than installing an in-ground backboard. As an aside, as editor of this site, I was an avid basketball player in my youth. My father installed a basketball hoop in the driveway of our Long Island summer home that got extensive use. In my case my father was basically a carpenter- so he was able to manage the installation himself. It was kind of complex because you have to tear out the driveway, pour in the concrete, insert the pole, and make sure that it is level. This hoop has withstood the test of time and has been a mainstay of the driveway for well over 20 years. In my own personal opinion, I think that in-ground basketball hoops look more attractive than the portable one- but these portable options might be a good place to start if you have kids and want to make sure that they are actually going to use the court. Anyway- one of the first things you should consider is the size of the backboard. Reading Lifetime.com’s website, they recommend that for younger players that are just learning how to play the game that a 44-inch backboard would be ideal. For teenagers, a 48 to 50-inch backboard would work. A 72-inch regulation-sized backboard is really ideal if you are intending to truly perfect the art of the bank shot Like Tim Duncan or Steph Curry. As well, the backboard material is another important consideration- for young children, you can get by with polyethylene or graphite backboards. For beginners an acrylic backboard is alright but if you truly want to step up your game a polycarbonate backboard Is the most advanced selection you can make. These have realistic looking glass effects that mimic the look and appeal of professional, NBA regulation hoops. A big consideration is the location- when I was growing up my father situated our inground hoop at the back of the driveway and even painted some markers on the court so I would know where the three-point line was as well as the foul line. This added a fair amount of realism- with a flood light illuminating the court at night I was able to emulate to the moves of some of my favorite New York Knicks basketball players and take long-distance jump shots just like John Starks. Unlike the in-ground options, these rolling systems mean that you can install them in various locations without the hassle of digging through dirt, sand, and asphalt to erect the hoop. Indeed, in many suburban neighborhoods, you’ll see these hoops wheeled to the front of the lawn onto the street- this provides a spacious area to play the sport, away from potentially damaging cars and off of the lawn. That said, while a paved street surface can be ideal, make sure you’re aware of local regulations concerning placing the basketball hoop on the street- you wouldn’t want to get a ticket for it. Another crucial feature in his height adjustment. When I was just starting to play in my early teenage years I couldn’t quite hoist the basketball up to the NBA regulation 10-foot hoop. It took me a number of years and a number of height adjustments before I was able to summon the strength to play at a regulation rim. It is important to purchase a hoop that is height adjustable that way you won’t frustrate young children and can accommodate their abilities while gradually increasing the height of the stanchion to the recommended limit. Another benefit that you likely already considered is that getting your kids, or even yourself, outdoors playing a sport is a fun and creative way to remain active and burn calories. If your children plan on playing a sport in middle school or high school, having their own rim provides a strong advantage over other local kids trying to make the same basketball team. You’ll also find that the rim becomes a focal point for fun, family activities. It brings the family together in a fun, though competitive, atmosphere. Indeed, with the penchant children have nowadays to glue themselves to televisions, iPads and other smart devices, an outdoor hoop can be a great way to motivate them to remain active.